Discover is your new one stop shop for all things app- and addon-related. Designed from the ground up to be easily handled by users as well as easily integrated for distributions. A place where skill level isn't blocking you from executing the action you want, in this case installing new apps and add-ons! Discover was redesigned from the ground up to make the experience of usage intuitive and clear. We've based the work on the new Kirigami-technology, new app delivery technologies as well as the safe repository system to create an application for any distribution and any skill level - an application which is as much as a joy to use as to provide to your users. 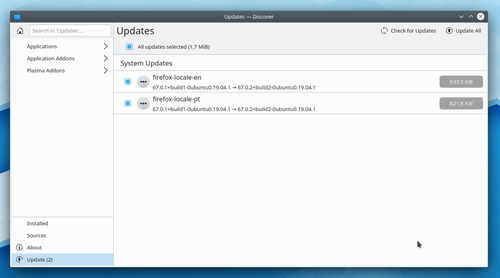 Discover is intended for users and distros where the terminal isn't the optimal solution for installation of apps and add-ons or updates. Where we want something intuitive and simple to use and above all safe to use. We've all been there, someone has copy pasted commands from some website and suddenly they destroyed their entire installation. From a users perspective, especially a new user or a casual user this is disastrous and they will not be able to easily discern where the fault is: this shady website or your distro. With Discover the focus is to empower you to browse, test, install apps and update the installation without fear of disastrous misspellings and where trust is given, not taken. Discover may be much but it is not an experts application for minute control of repos. It is not a replacement intended to compete with the terminal for experienced expert users. Our goal has been to focus clearer on a certain set of users where an application such as this is not only needed, but critical to their usage. To do this we have excluded other user groups entirely from the application goals. This doesn't mean they can't use Discover just that their specific use cases may not be perfectly covered. Discover is not perfectly "child safe". It will never be something with which you can force the hand of the user, we believe in empowerment and try to guide users through safe choices, but never force them into an action. Do not expect Discover to remove those options from your users. Discover is made for usage - it was made to be intuitive. So try it out and see for yourself. The easiest way to search for an app is to simply start typing in the name or what the app is intended to do. The search field will always be selected by default and the only times it isn't nothing will happen, the search field is greyed out and when you click it you are brought back to the application search. So don't be scared of the keyboard! The search is always performed within the category you are currently in (this is also indicated in the placeholder text of the search field), so be sure to navigate to the category you want to search in before entering your search term. 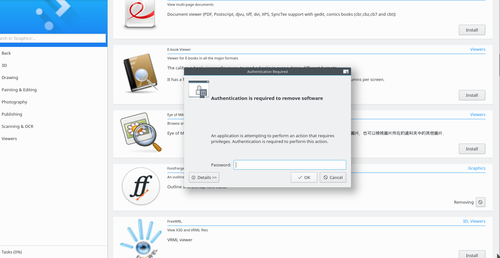 If you just want to browse or feel unclear on what the application name is or how to best define it in text simply click either "Applications", "Plasma Add-ons", or "Application Add-ons". 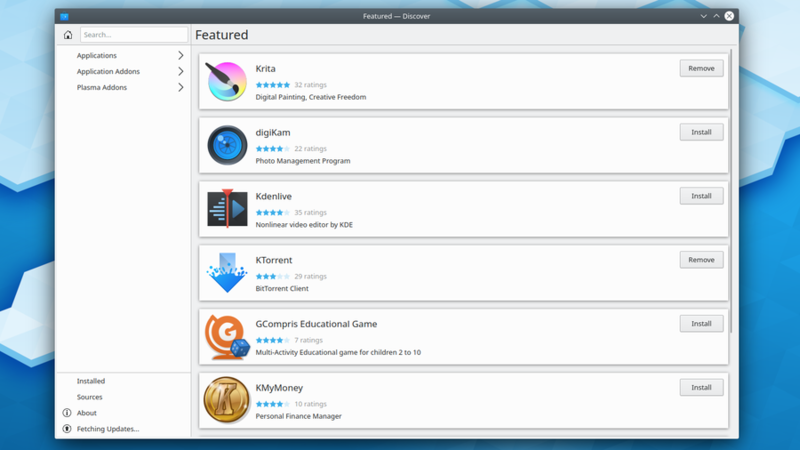 You will find complete applications in the "Applications" category, Plasma widgets and extensions in "Plasma Add-ons" and extensions for your apps like snippets for coding apps in Application Add-ons. Let's focus on complete applications for now! Below you can see the category tree that is displayed when you click "Applications". Whenever you want to go back, the "Back" button underneath the search field and in the top of the categories will bring you back to the previous section! From this list of six categories you can go deeper into some categories to display subcategories by clicking them. By clicking "back" you can always reach the starting point. From here you can continue searching freely. 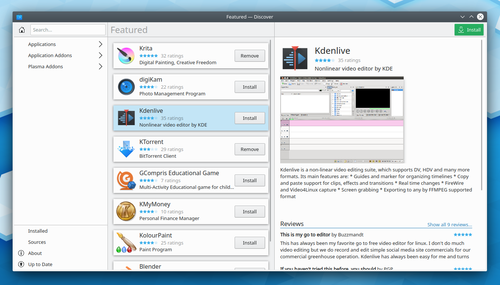 In the column in the middle/to the right in the application you have all installable apps or extensions. When you click them a third column on the right will open with detail info about that application or extension as it is available. You can now scroll through the list and click other apps to display detailed information about them. To remove the right-hand column click on one of the categories in the left column to bring you back to the beginning of your search. Now try to resize the window. See what happens? Discover, using Kirigami the widget library for convergent apps will react and change to the size of screen you have available. Try resizing it to about the size of a cellphone. It reshapes to better fit that size. Now to you sitting on a computer this means that if you have a smaller screen the right column will cover the center to give you the user more visual space for the application you chose to get more information on. To get back from that simply hit the back button in the left column! Installing an application is easy! When you've found the application that you want, simply click the "Install" button in the middle column and it will begin to install. If you are checking out the detailed information like the image below, you can also click "Install" in the bottom right of the right hand column. 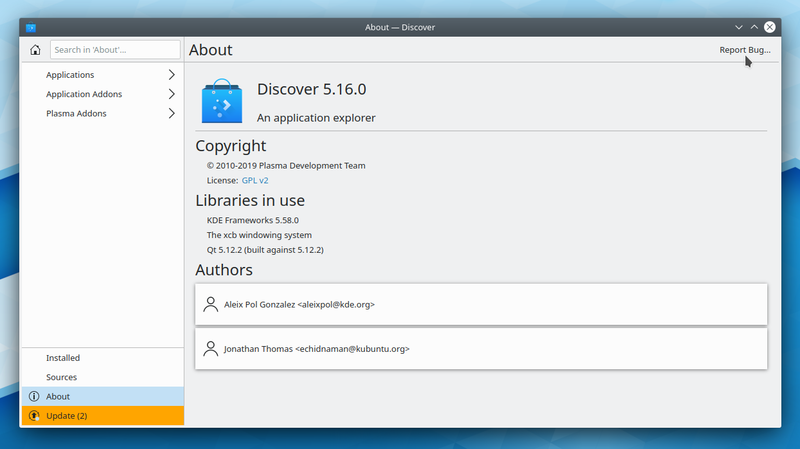 Installation with Discover is just as simple as that. To uninstall apps is just as easy as installing them. Simply find the application that you wish to uninstall in the normal manner - you can note that it has "remove" instead of "install" in the little button next to it. Then click it! All you have to do then is fill in your password and the application is removed directly without fuss. 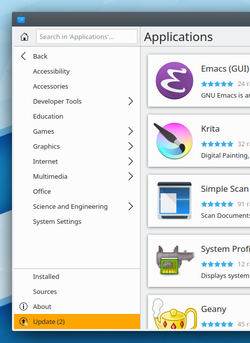 You can also easily click "Installed" in the left hand column to see all applications and extensions you have installed in your system! That way you can simply scroll through the entire list and look for the app or extensions you wish to uninstall and with ease click "remove". That's all that's needed! In the list you can see all the software that will be updated when you click "Update" at the top right. You can click each individual row to get further information about it. If something is not to your liking, simply uncheck it on the left of the name of the software and it will be held back from the update. In this section we will bring up how to handle upgrades, repositories and how to file bugs. Currently Discover focuses on stability and safety and interactions with repositories is beyond the scope of Discover in the current iteration (changing repositories is also potentially dangerous for inexperienced users). 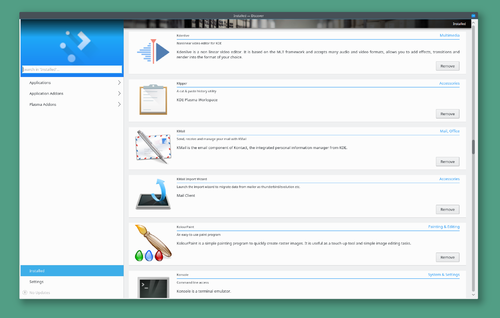 Future versions will include a more extensive repository feature and parts of the interface can be tested here. Sometimes you may want to check the system for updates manually. Discover will check for you automatically, but perhaps you are waiting for something good and want to look to make sure it hasn't arrived yet. In that case go to "Settings" in the left column, click "More" at the top of the middle column and then "Check for updates". While usually the user will be interacting with Discover by using the mouse or touch interfaces, it's also possible to navigate it by using the keyboard. This page was last modified on 16 August 2018, at 13:08. Content is available under Creative Commons License SA 4.0 unless otherwise noted.